Irfan Masih died on 1 June, in Umar Kot Civil Hospital, Sindh, 300 kilometers from Karachi. Umar Kot has about 75 Christian families; almost all of them work as sanitary workers, a job that many Muslims refuse to do. A number of Umar Kot Christians blocked a crossing after Irfan Masih’s death, demanding that a criminal case be registered against three doctors. Senior Superintendent of Police Usman Javed Bajwa told World Watch Monitor that a case of murder by negligence had eventually been registered, and the police would submit its report on the merit in the court. Other experts on Pakistan told World Watch Monitor that this treatment of minorities has more to do with the legacy of the Indian caste system than Islamic theology about how the Ramadan fast could be invalidated by certain ‘restrictions’ on the faster. For example, there are exemptions from fasting for Muslim travellers or people who are ill.
Unmarried 35-year-old Irfan Masih, who lived with his family, reached his workplace at about 7 am on 1 June. Two Christian sanitary workers – Shaukat Masih and Yaqoob Masih – were ordered by their seniors, with Irfan, to unblock sewerage lines. They were not provided with any protective gear, his brother Parvaiz told World Watch Monitor. Parvaiz Masih told World Watch Monitor: “When they reached Chorr Road, Yaqoob went down into the manhole. Irfan was a supervisor, so had no responsibility to go down the manhole, but when Yaqoob opened the blocked pipe, the poisonous gas leaked out and he fell unconscious. “My brother Irfan then went down to tie a rope to Yaqoob to bring him up. When Yaqoob was being pulled up, the knot came loose: Yaqoob fell on Irfan, who also fainted. Lastly Shaukat went down to bring them both up but he also fainted. “It was around 8am when I received a call and we all raced to the spot. Shaukat’s brother Faisal also reached there. He tied one rope onto himself and took another rope to tie onto the bodies of the three. That’s how we pulled the three, one by one, out of the manhole. Umar Kot police station registered a case against six people, including the three doctors, after Masih’s father, Nazir, complained. Kanwal Lal Malhi, working with a local NGO, told World Watch Monitor that several organizations and human rights activists helped the Christians to organize the protest. “I remained with the family until the government decided to take up the case. Otherwise, initially, the police were unwilling to listen to them”. A report by Minority Rights Commission published in 2012 said that at least 70 Christians have died since 1988 while cleaning sewerage pipelines. 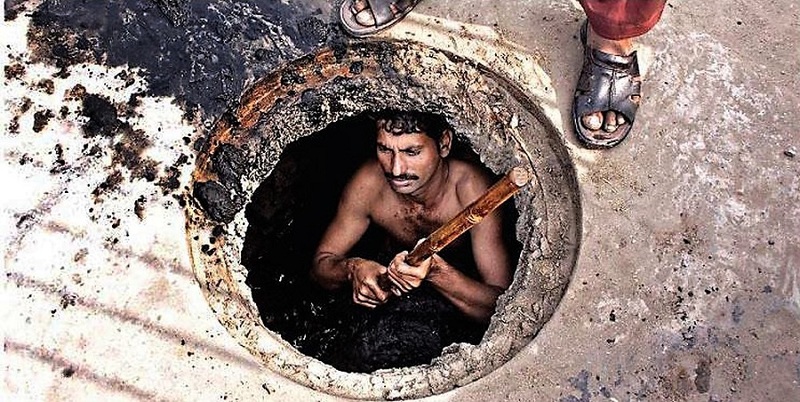 Journalist, Sameer Ajmal, reported in the daily Urdu ‘Jang’ newspaper on 25 May that candidates for sewerage cleaner jobs are still expected to dive into blocked manholes. The incident, reported on all TV channels and in newspapers, has shaken Pakistanis’ conscience; the Sindh government is considering compensation for the bereaved family.